Our Incredibly Versatile Neck Pillow! 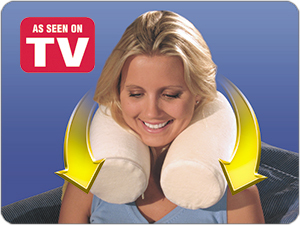 The Twist neck pillow allows you to bend it into virtually any shape you want - and it stays! Perfect for supporting your head and neck - especially during travel. Use it as a leg pillow, a lumbar pillow - the possibilities are endless. Like no other pillow available, the Contour Twist bends into any shape or position and stays there!It's soft poly-foam and articulating linkage deep inside easily forms and comfortably supports you in any place or position - at home, on the plane, in the car. Features a fully articulated internal link system allows for complete flexibility and hold. Soft poly-foam completely surrounds internal linkage system for total comfort. Soft, washable velour cover is easy to remove and clean. Do you have neck pain, arthritis, headaches? Save your neck with the Contour Twist Pillow! Bend It! Shape It! Twist It! The Twist Pillow Holds ANY Position for the Ultimate in Comfort & Support! Your neck is made up of fragile joints, ligaments and muscles -- It's the most vulnerable part of your spine. The Contour Twist Pillow was designed to be positioned exactly the way you want for perfect neck saving relief! The secret is the internal plastic spine that bends and twists, conforming and HOLDING the pillow in ANY position. Take it to bed as the ultimate leg pillow that always stays put. Realize all-night neck relief! Shape it for a bed time head pillow. The Contour Twist® can even be used as a custom back support in any chair! Bend it to cradle and comfort your newborn in a snug, secure position. Your children can use it to support their necks during long, sleepy car rides. The Contour Twist is so versatile, it'll satisfy everyone's needs in the house, whether they're working, sleeping or playing! Versatile pillow allows you to shape and bend into any position providing your head and neck that perfect support you were looking for. Also, can be used as a leg pillow or lumbar pillow - possibilities are endless! I love the twist neck travel pillow. I got one for my husband as well and also replaced one that my dog chewed up he loved it so much!! LoL we use them on the couch or in the car. They make great traveling companions while taking trips and staying in hotels or motels and you just can’t get the right adjustment to the pillows they give you. One thing though, it is difficult to get the covers off to wash them and even more difficult to get them back on after washing. Perhaps a longer zipper? I love this neck pillow it works instantly for me it takes away the tension in my neck I love to nap in my rocking chair and the pillow supports my neck.My adult daughter wants one now. Several years ago my wife purchased two of the original versions of this product, one for each of us. Mine was left in a hotel by mistake. My wife still has hers. The original version is the best ever. The basic difference is that the new one is 6 inches shorter and has less padding. Although I would describe it as OK, it just is not up to the standard of the original version, which I would pay more to get. It is a shame that this company down-graded this product. This is my 2nd twist pillow. I bought the 1st over 12 years ago. I can twist one end up when seated so my head is supported while I sleep flying over the Atlantic. I am able to use it in a hotel as a CPAP pillow when I Use my machine. I was stopped once by French Security in CDG Airport. B/c I could not remove the spine, the agent wanted to cut through the foam. RECOMMENDATION for travellers . . . Have a picture w/description with you & ask for a supervisor should you be questioned. Bought 1 in 1997 & found I could turn up one end to rest my head while I sleep. Am a CPAP user. It is great to sleep on as the pillow does not interfere with the mask. It goes w/ me on all travels now. Purchased one in 1997 & have used it since when flying. I prefer to sleep on transAtlantic flights. I can bend the spine so one end is up & I can rest my head against it. As a CPAP user & a side sleeper I can adjust it on trips so the pillow does not interfere with my mask. I saw one of these pillows while on a long flight oversees and continued to look for one of my own for two years. I finally found one at a small drug store and bought the last one they had. Once I new who made it, I looked them up on their web page and discovered the full line of amazing products. After reviewing all the poducts, I still decided to go with more of the same thing because it is so versatile. Am enjoying the pillow very much and have decided to purchase extras as gifts. Delightful! I wish more things in life would follow the example of the Twisty; comfortable, flexible, and stay the way it's molded. And... it was shipped to me immediately!